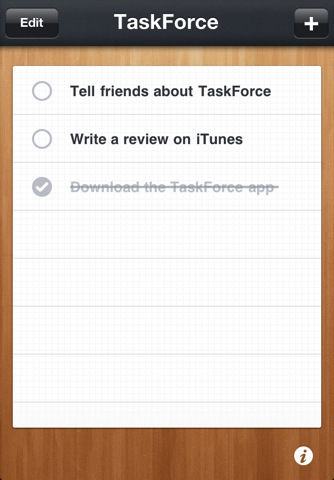 Of all the to do list apps in all the world, you could easily argue that Taskforce is one of the simplest. The seamless design provides nothing extra, but through masterful management Toopia also leaves nothing to be desired. To add a task you tap the plus button in the upper right hand corner and type away. Hitting Done on the iPhone keyboard adds the task to your list (which is presented as lined graph paper against an elegant wood panel) for easy reference. From there you can click on the circle to the left of the task or swipe to the right to cross it out and turn the black type to gray. If you’ve grayed out the task accidentally the matter can be fixed with a second run over the task. Swiping from right to left on the other hand, pops up a red delete button and lets you remove the task from your list entirely. You can also edit tasks en masse via the Edit button in the upper left hand corner of the app, but beyond that most of your everyday usage is as simple as that. 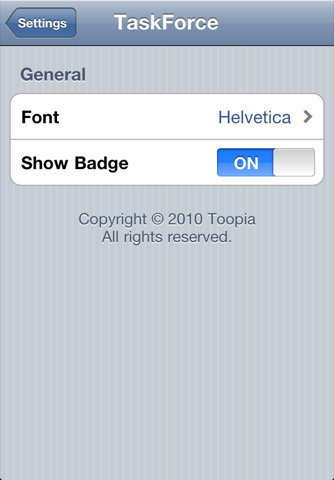 An information button in the lower right corner gives you quick access to instructions, as well as quick links for sending feedback or reviewing TaskForce in iTunes. The only other settings that apply to the app exist within your iPhone’s main settings application. By finding TaskForce in the apps list you can choose between chalkboard, Helvetica, or marker felt ink fonts for your list’s presentation. You can also choose to show the TaskForce badge, which is essentially a red pop up display of the number of tasks you have left to complete. After that there’s literally nothing left to learn about TaskForce, but that’s the point. While you could literally spend hours messing about with the due dates and prioritization of tasks in other apps, this is the pared down, almost paper and pencil type of timeless to do list that always has (and always will) work. If you’re about writing down your list and getting things done, TaskForce could very well be for you. Bottom Line: This clean, concise app gets right to the heart of the matter so you can get down to business. To do lists don’t get any simpler than TaskForce.